Product prices and availability are accurate as of 2019-04-11 04:14:53 EDT and are subject to change. Any price and availability information displayed on http://www.amazon.com/ at the time of purchase will apply to the purchase of this product. Load the CD onto your PC and your embroidery machine does the rest*. The color sequence chart guides you through each thread color. The program works with Windows '95 and higher. Includes one Multiformat CD and instructions. 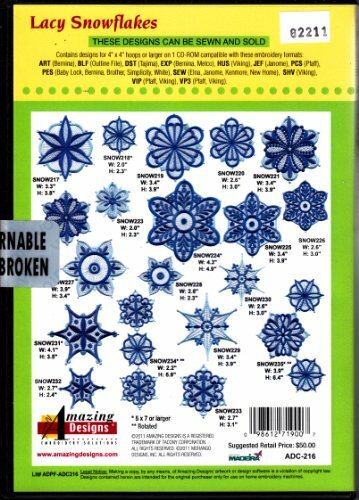 Machine Format: ART, BLF, DST, EXP, HUS, JEF, PCS, PES, SEW, SHV, VIP, VP3 35 Classic Designs Contains 28 designs for 4" x 4" hoops Contains 7 designs for 5" x 7" hoops Snowflakes come in all shapes and sizes and are one of nature’s most delicate creations. 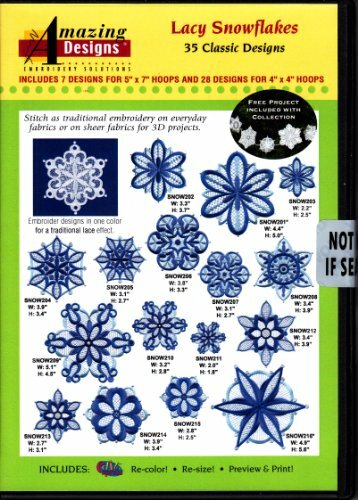 Use the Lacy Snowflakes embroidery designs to add a touch of elegance to all of your winter projects.